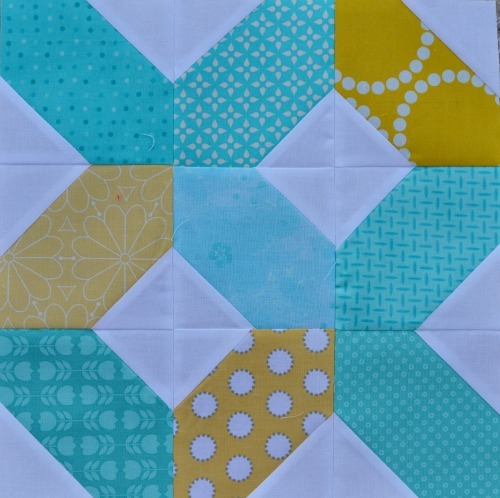 Here is another block for this series to show you. 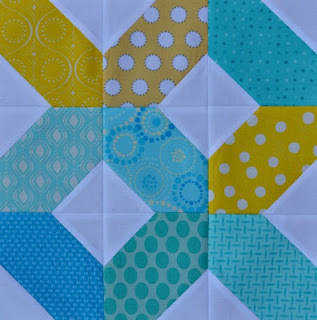 I have all nine of them stitched into a mini quilt and ready to be quilted, but I'm not sure how to quilt it. Stay tuned. I promise to show it to you when I'm done! 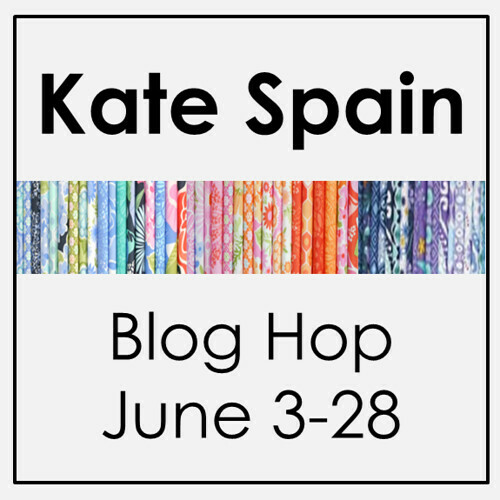 When Alyce at Blossom Heart Quilts announced she was doing a Kate Spain blog hop, I was so excited - I mean I LOVE Kate Spain. That excitement quickly turned to sadness as I realized I love her so much that I don't have any projects with her fabric. I buy it......and look at it.......and save it.......BOO! You buy it to use it right? So....every day I go and visit these lovely projects and wish I didn't hold mine in such high regard and then.....I remembered. Long ago, there was a sale (or free shipping) or something that prompted me to get a layer cake of Terrain. It's in a pink bin and my original plan isn't interesting anymore so now I am cutting it up into HST's - yes, the entire layer cake. (If you follow me on Instagram, you will see that is exactly what I was doing while watching the play-off game the other night). Funny thing is, I don't really like HST's. Too much work. I must admit though, there are so many truly lovely projects out there that I have become a little soft on them now. No idea on the final layout but I'm branching out! The point of this is, use it! It won't make you happy if it is sitting in a stash stack somewhere and you aren't looking at it. And then *light bulb* it came to me. I DID have a Kate Spain quilt. Yippee! It was my first one. 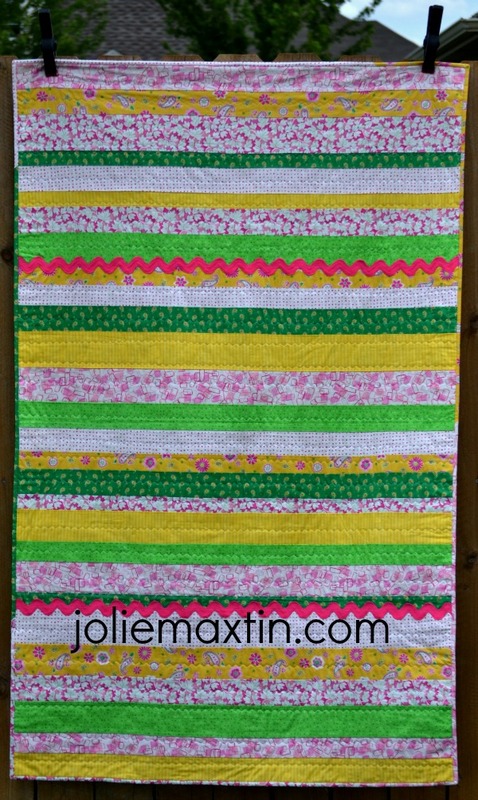 If you would like to see the entire quilt and post, go here. 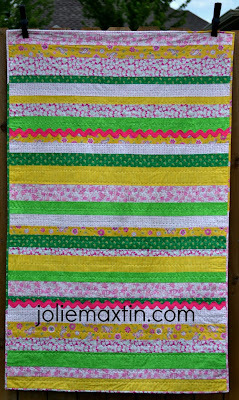 But...I am taking Tessa's advice and took some different shots of the quilt for you to view. 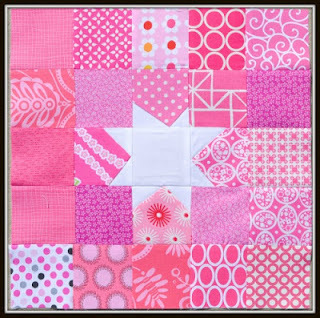 The pattern is from KarrieLyne and the quilting is by Kathy. But wait....we are in June. Isn't that grand! Christine liked our June block so much that she decided on the same one for July in my Simply Solids Bee. 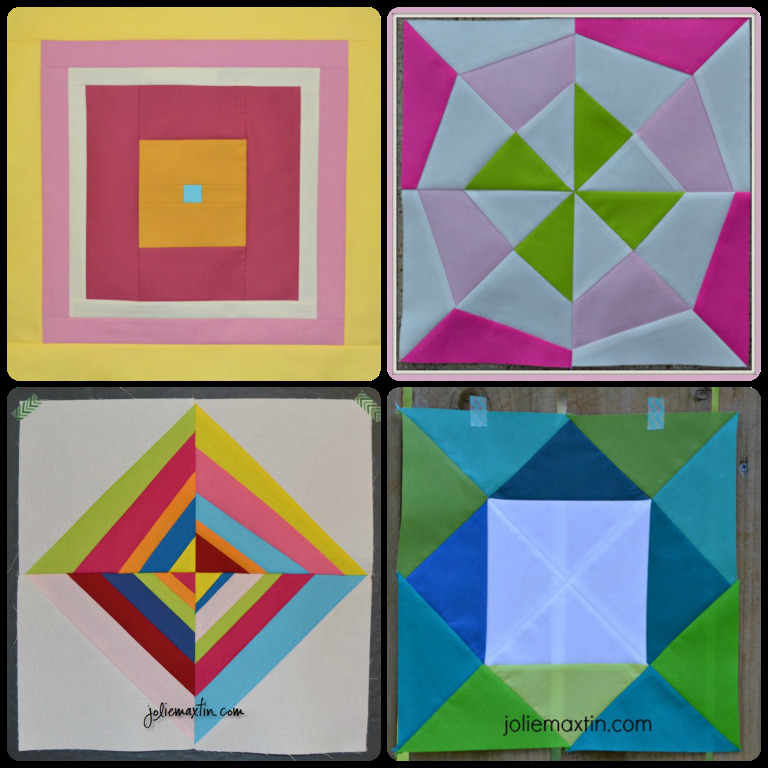 These are so much fun to put together and the finished quilts are going to be fabulous! She asked for "bright" so I used Kona Bright Periwinkle and Kona Bright Pink for this one. It's in the mail Christine! When I first got interested in quilting I went to a local fabric store to buy some fat quarters and I saw a quilt on the wall that really caught my eye! It was done in all black and white fabrics with big red ric-rac and called "Wrapping Paper". 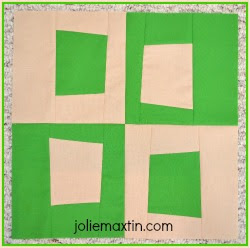 I duplicated the pattern (cut strips in various widths from 1"-3") and stitched it up. It's been done for quite some time (over a year or two) but I just quilted it last month. It was only a moment when I thought about machine binding vs. hand binding and decided on the latter. It really is fun for me to hand bind so I whipped that out this weekend and here it is. 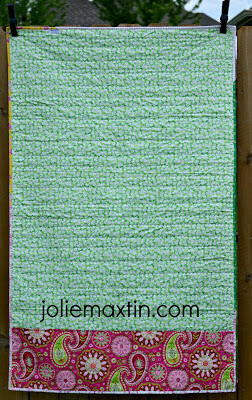 I'm not sure if this will be a gift quilt or we'll use it, but when I spread it out on the grass, the dogs liked it so it may already be claimed. 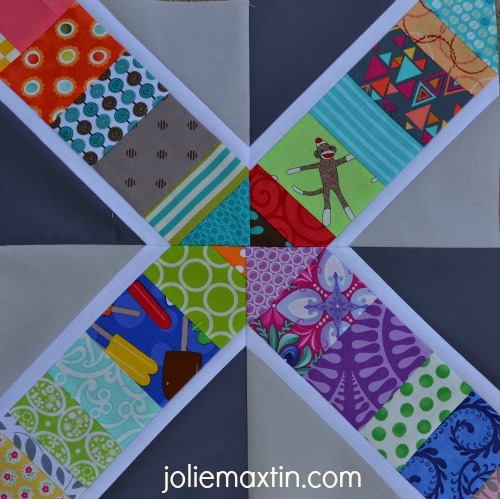 This quilt really shows how personal taste evolves. For my newer readers, I do NOT like green, yet in my earlier projects I used it a lot and it surprises me, even now. Is there a color you used to use but now you don't? For those of you who are first time visitors to my blog – Welcome!! A big shout out to Beth over at Plum and June for setting up this fun blog hop for all of us. A lot of work (and follow-up) goes into organizing this and I just want to say thank you to her. Beth has suggested some questions to help us get to know one another better so here we go! Do you belong to or would you like to belong to bees, QALs, etc.. Because it has been so long since I first joined Flickr (where I have participated in over two dozen bees and swaps) I don’t recall where I read or who suggested that as a good bee/swap platform but it is fantastic! If you aren’t on Flickr, I would highly recommend you join. You can dip in slowly and do a bee like NuBee’s where you only have a one month commitment or you can go for the gusto and join one with a six month or year commitment – it’s all up to you. 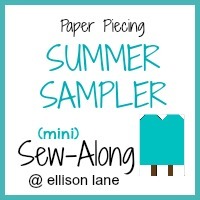 Have you attended or are you planning to attend any sewing get togethers like Sewing Summit, Quiltcon, etc.. Last year I attended Sewing Summit and had a blast, it was awesome! Because the group of friends I bonded with prefer smaller gatherings, we are headed to the Northeast this fall for a private retreat so I won’t be attending this year, but if you have a chance to go or are "thinking" about it, I highly recommend it not for the classes, but for the friendships. 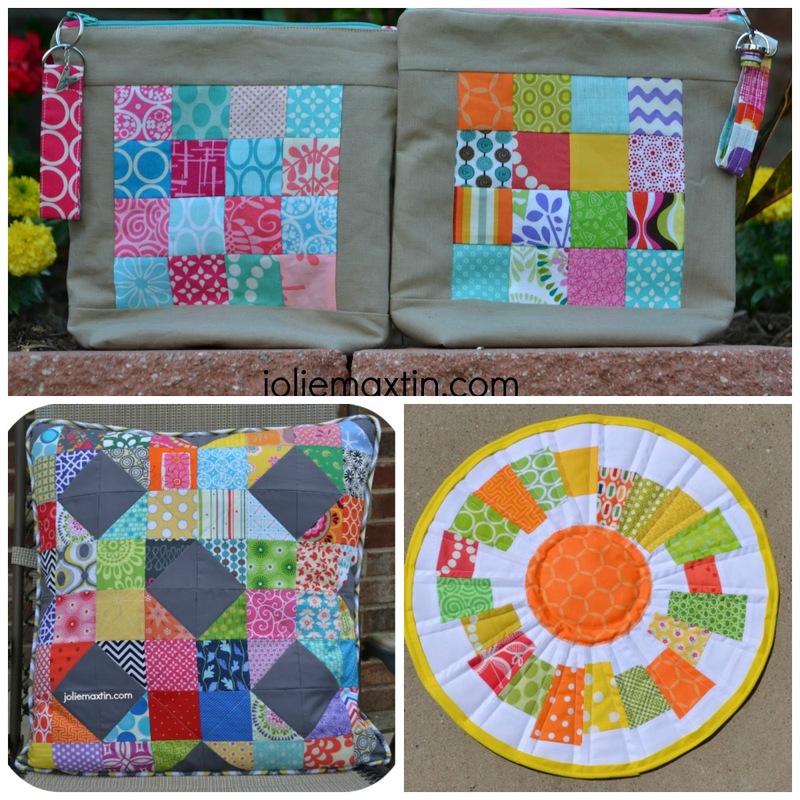 You end up hanging out with other girls who LOVE to sew as much as you do - really! 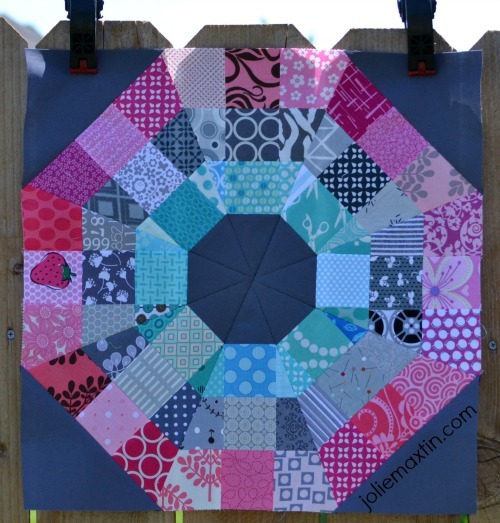 Quiltcon-yes! I was so excited to attend a quilt show that was all modern! Funny thing, it was mostly modern, but there were a few quilts that I wouldn’t have considered modern at all. In addition, there was a lot of conversation about the judging, the winners, the entrants and the topic that is always spinning in our modern world...modern vs. traditional. 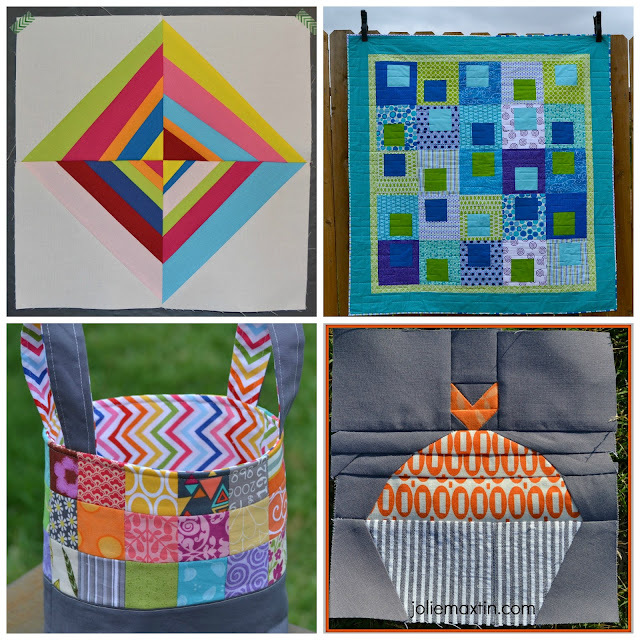 Let me direct you to Craftsy to the Quiltcon Lecture Series. I am in love with the perspective of Mary Fons . She comments on that very topic with some fantastic points in her presentation titled – Notes from a Quilt Mafia Daughter. Download the series (free) and listen to her – you will be glad you did. What are you working on now? Where do I start? 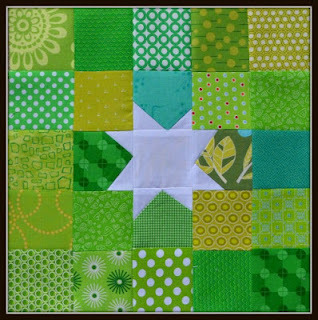 I am enrolled in Lucky Stars BOM (a new paper pieced star every month), Skillbuilder BOM (two blocks every month with new techniques each month), Simply Solids (one block a month for each bee mate, Modern Stash (just finished Q1&2) and signed up for Q3&4, and so many more! I won’t bore you with the details, but I am list person and it makes me happy to check off these projects every month, not to mention, make things for other folks. 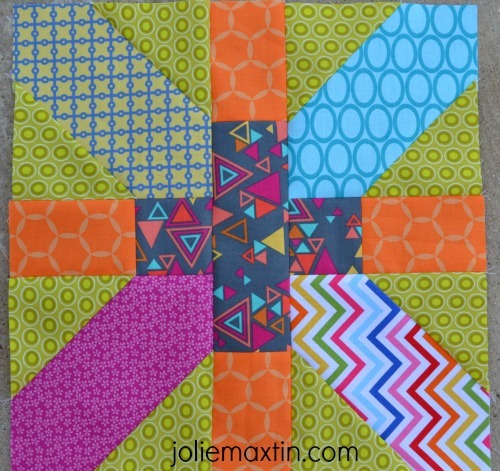 The latest block I completed in the Skillbuilder BOM is called Switz. What type of sewing machine do you use ? 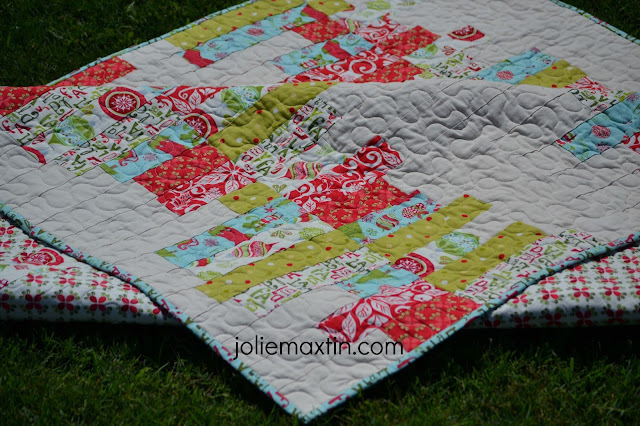 – I use a Bernina 630 QE, which I have used more and more often as my quilting appetite has grown larger. 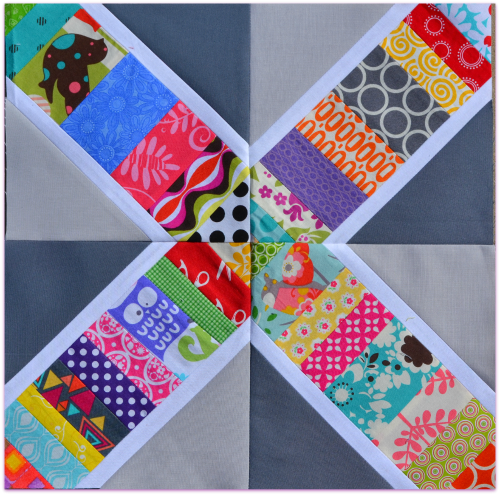 What is your favorite/least favorite part of sewing/quilting? When I paper piece and try to be stingy with the fabric, then turn it over and it doesn’t fit – Gah! I hate that! I can’t stand to pick out those little 1.5” stitches, one at a time. 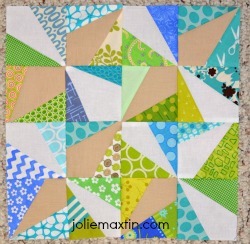 You would think I would know better because I do a lot of paper piecing, but nope, it still happens. My favorite part is sewing the last seam on a quilt top – It is in that moment that I am most happy! What other hobbies do you have? I am a voracious reader. I have never taken a speed reading class but I can read a novel in about 3 hours. My favorite flights are exactly that long, just enough time to get through one book (DFW-LAX) is great for that! I love John Grishman books but lately have been reading Michael Connelly too. I enjoy the lawyer/crime type books but books about the mind/marketing influence/human behavior are just as interesting. I love to travel! I love to fly! It is important to go to new places to be exposed to how other folks live. Sometimes it makes me humble and appreciate what I have but other times it helps me consider other things I want to incorporate in my life. What are your favorite quilting notions? Clover clips! They work well for so many projects! They hold your binding to your quilt, allow you to sew a zipper without pinning and really clamp down on thick projects (like bags) without fighting with pins. These are well worth the investment! Do you have any blogging or blog photography tips/tricks to share? Try to always take pictures in natural light. It makes a huge difference, I promise you! When I go back and look at some of my first photos, the difference is obvious. If you want to add your blog name or do some basic photo edits to your photos, I would suggest Picmonkey. It is a free program and allows you to round corners, add text, sharpen colors, enhance exposure, make a collage and more! One tip I read a while back that I really try to incorporate in my blog posts, is to always include at least one link back to a previous post of yours. This will allow readers to easily see more of your work. What other social media do you actively use? I have a Twitter account but currently, I just love Instagram. 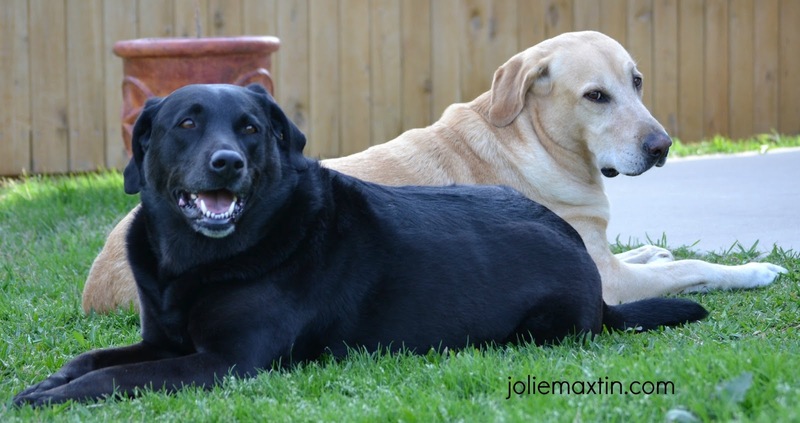 Follow me @joliemaxtin on Instagram and #joliemaxtin on Twitter. 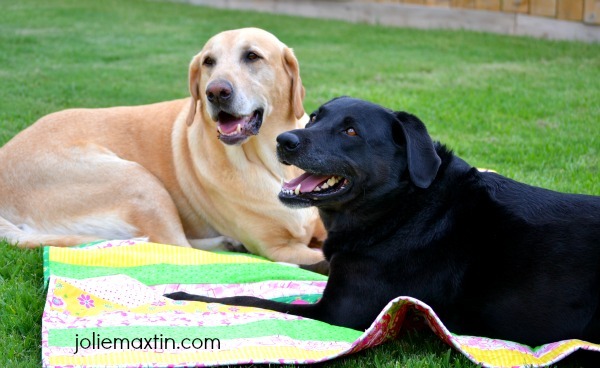 You won’t see many tweets from me but I do share random shots of our two Labradors and of course quilting projects, on Instagram. I hope I have not gone overboard on the personal component as it is rare for me, but based on some conversations lately, it seems that readers like it so there you go! I write like I talk (fast and bouncing from topic to topic). 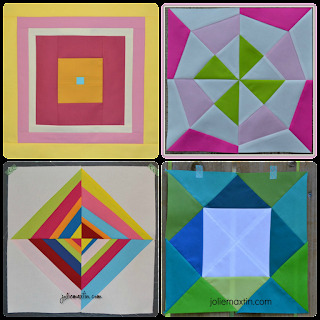 For a bit more, my About Me page covers that, if you want to view quilts I have made, go here and to browse my flickr stream here. This post got long but I hope you enjoyed it and I hope to see you back here soon! Please check out the other fabulous bloggers today as they have some great posts! And if you just can’t get enough, go back to this post for the lovely gals who kicked off the blog hop for us last week. Melissa @ Melia Mae Quilting doesn't collect pins or needlebooks, but she has 6 of ???? 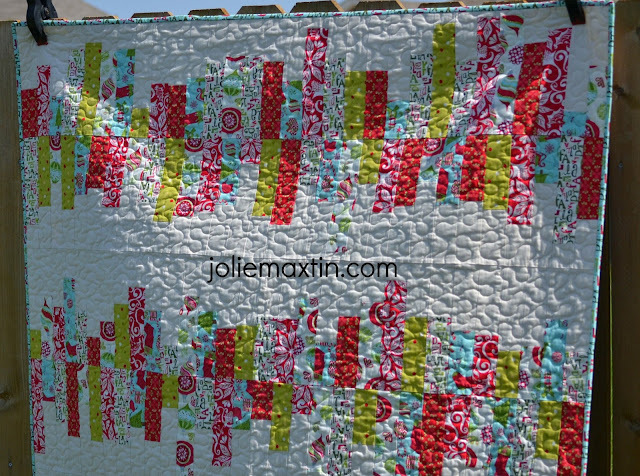 Molli @ Molli Sparkles shows you how to "cinch it up"
Valerie @ Between Quilts : Her Racing Stripes quilt has really gotten around! 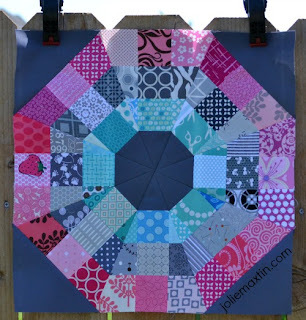 Beth at Plum and June is going for Round 2 in 2013 to help us get to know one another and also discover some new quilters among us. Join us this summer as we do just that! 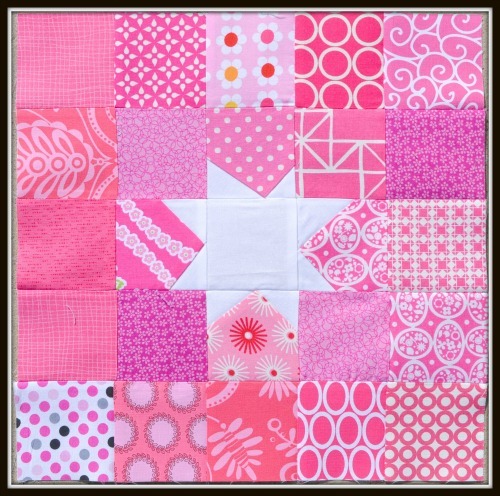 Ange who entered her first quilt competition - Way to Go! Kim who got sewing machine tips from someone interesting - go find out! Erica who recently had her pattern featured on Moda Bake Shop - Woo hoo! If you haven't made time yet, go back and see what these 8 gals are up to and a little bit about them - every one is a great read! 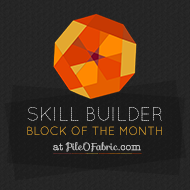 Are you participating in the Pile O Fabric Skillbuilder this year? How is your progress? I started great, was on time and then.....we hit hexagons. Now don't get me wrong, I love to hand bind so I would think that doing these little hexi's would be great fun. Yeah. Not so much. It is really hard to even cut out the fabric. This is partly because after watching all the videos (at least 4, maybe 5) it seemed like so many steps, seems like it took forever and it wasn't exciting. So now I am behind and I HATE that. But...not enough to do a whole lot about it. My plan is to work on them throughout the year and I'll have them done by the end. 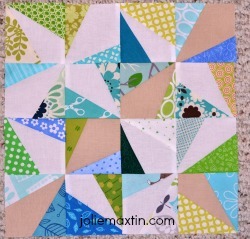 However, on a happy note, this month is Paper Piecing and I really enjoy this technique. Here is my Geo Swirl Block. Decisions still need to made on how to quilt this QAYG piece, what do you think? So far in this series I have quilted with red thread in red areas and white in the other. Should I mix it up? or stick with the program? Please let me know your thoughts in the comments! 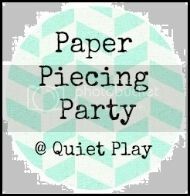 I am also linking up with Kristy at Quiet Play for Paper Piecing Friday! 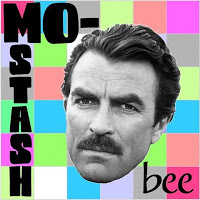 June brings the conclusion of the Modern Stash Bee. We made some excellent blocks in this hive and everyone was fantastic to work with! Joanne requested this Wonky Block and finally I block I was familiar with as it was a bee block for modern quilt guild a few months ago. She requested cool colors as it is for a little one that we don't know the gender of yet, so....since my blue/green scraps were running over it worked out perfectly! I apologize for no natural light in these photos but I was headed to the post office the day after I finished and it was important to me to get them sent off promptly!